Last week in the Scottish Parliament MSPs voted with the SNP Government to allow the additional money raised via council tax rises to be spent in other parts of Scotland. Council taxes are set to rise for over 9,000 properties in Midlothian, some by well over £500 per year. Properties in Council tax bands E-H will be affected, with the changes set to raise an extra £1.7 million in the region. Following the vote the Scottish Government will claw this money back by cutting the grant they currently provide to councils to pay for their educational attainment fund which targets areas of Scotland. This means that the majority of the money raised in Midlothian will be spent in places like Glasgow, leaving communities paying extra money but not reaping the benefits. “Although I support the establishment of an educational attainment fund, I do not support these centralist proposals that the SNP Scottish Government want to introduce. “Money raised by local households should be spent on local services; instead the SNP government is taking this power away and denying locally elected councillors a say on where the extra money could be better spent. 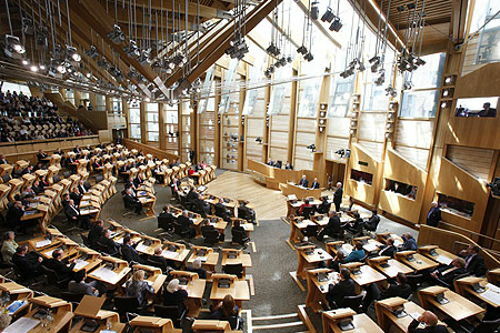 Andy Wightman MSP, Local Government spokesperson for the Scottish Greens, welcomed the vote in Parliament which saw the Scottish Government forced to accept widespread concerns about their approach to local taxation. Ministers had attempted to amend Mr Wightman’s amendment to the Government motion, in a bid to delete modest criticisms of the Government. But at decision time, opposition MSPs supported Mr Wightman’s amendment and the amended motion was then approved after Green, Labour and SNP MSPs backed it. The Conservatives and Liberal Democrats voted against it. “This minority Government must expect their record to be challenged, and Greens will always seek to do this in a constructive way. At no point have we ever stood in the way of the changes to Council Tax as they are better than nothing. It has been bizarre to see SNP Ministers threatening to vote down their own policy simply because they don’t like fair criticism. Midlothian Labour Councillors again blasted the SNP administration in Midlothian for supporting the move. “Council tax is a local tax for local priorities. I have no objection to the Scottish Government spending extra money on priority areas, but it should come from central resources not the Council Tax payers in Midlothian. We have enough pressure on our scarce resources without the Scottish Government grabbing a share. Using Local taxes for national priorities sets a dangerous precedent and ALL local Councillors irrespective of the Party they belong to should be fighting against this. “We are making steady progress in trying to close the educational attainment gaps here in Midlothian, but that takes resources and the forthcoming budget is likely to see significant cuts to spending in areas that will impact on this work. “What I find incredible and extremely disappointing is the lack of challenge to this tax grab by local SNP Councillors, who continue to toe the Party line as they do in so many other instances. They should be standing up for Midlothian and condemning the SNP Government for this move. “Instead Councillor Kelly Parry, the SNP finance Spokesperson in Midlothian, argued at the last Council meeting that Midlothian would be “no worse off” as a result of the Council tax increases. Tell that to the Midlothian residents who will see no local benefits from £1.2m of their local Council tax payments.